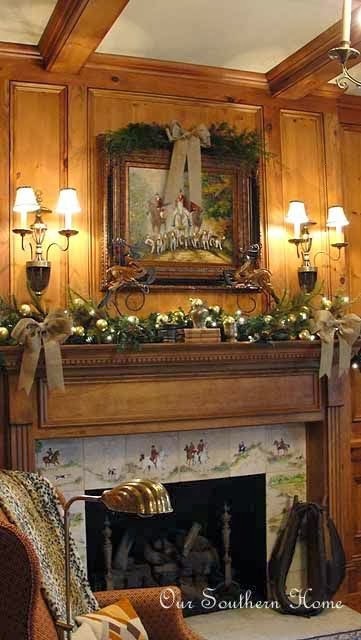 A COZY FIREPLACE ~ The Focal Point of the Room! 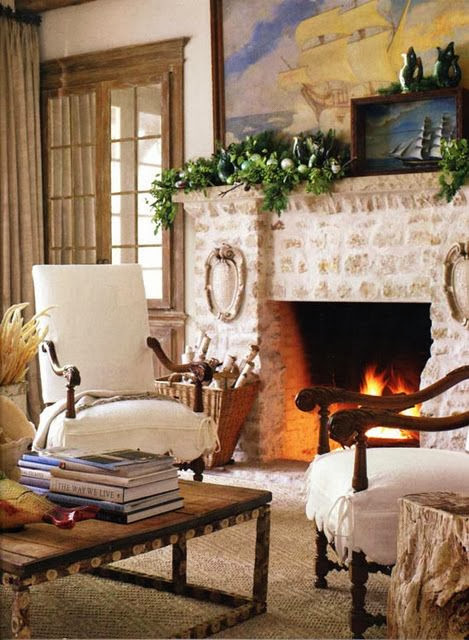 There is nothing like a cozy fireplace. it's the focal point of the room. 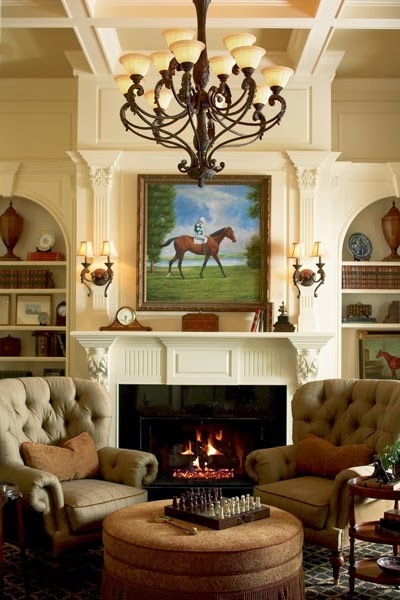 As we move along in updating things around here, our great-room fireplace comes to mind. or we could cover the brick with stone. 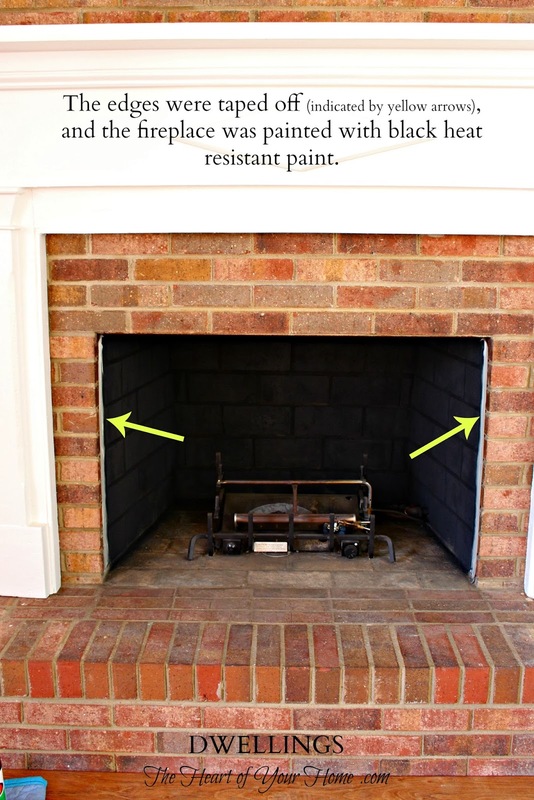 There are many options for updating a fireplace. 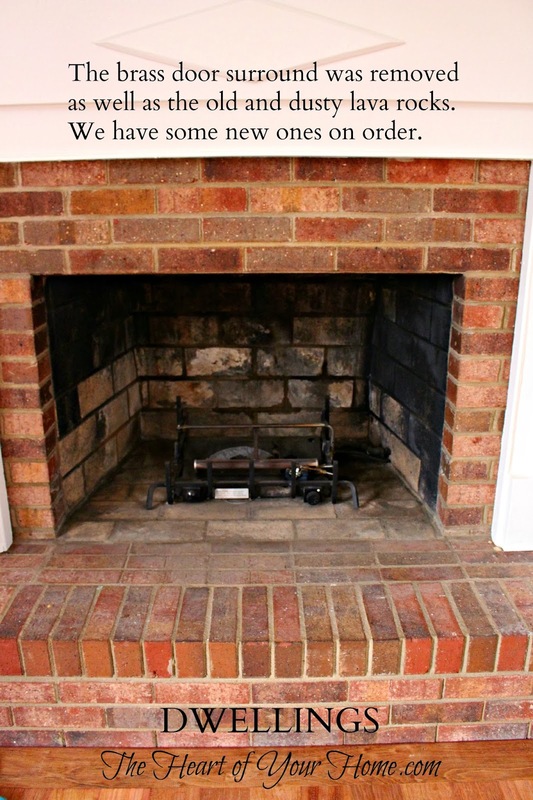 my hope was to use the same stone to reface the fireplace. You can see the porch stone here...Stone Front Porch. Stone comes in every shade, size, and texture imaginable, so the possibilities are endless. So many options, aren't there! 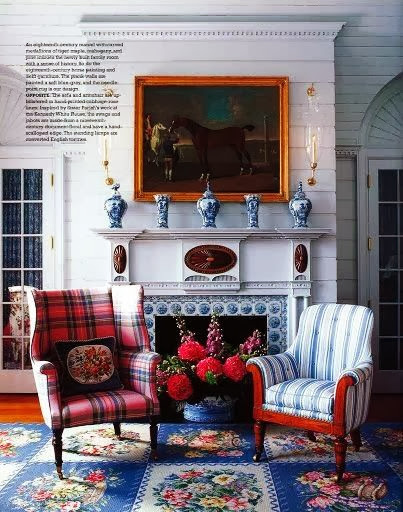 The mantel is old ~ a reclaimed piece ~ and I like it. They come tomorrow to finish the floors...yay! but it's starting to look a little bit better! 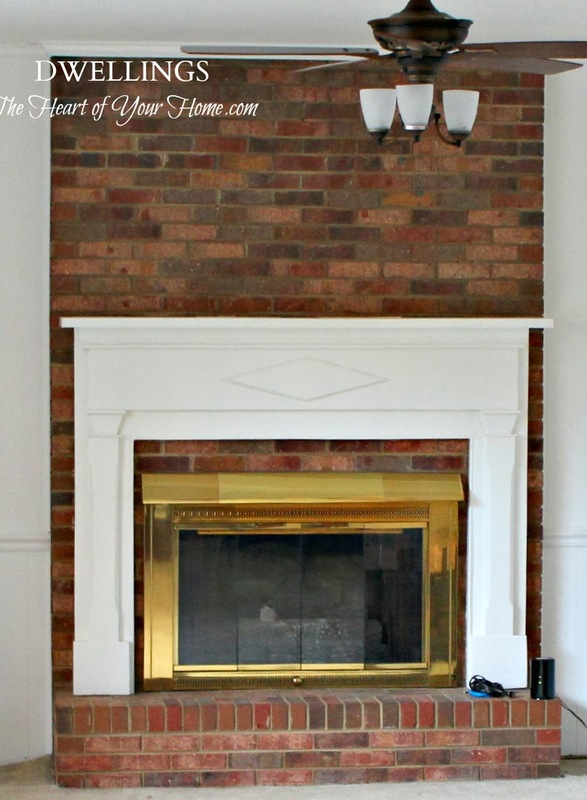 What does your dream fireplace look like...stone, tiled, an insert? Great inspiration pics! 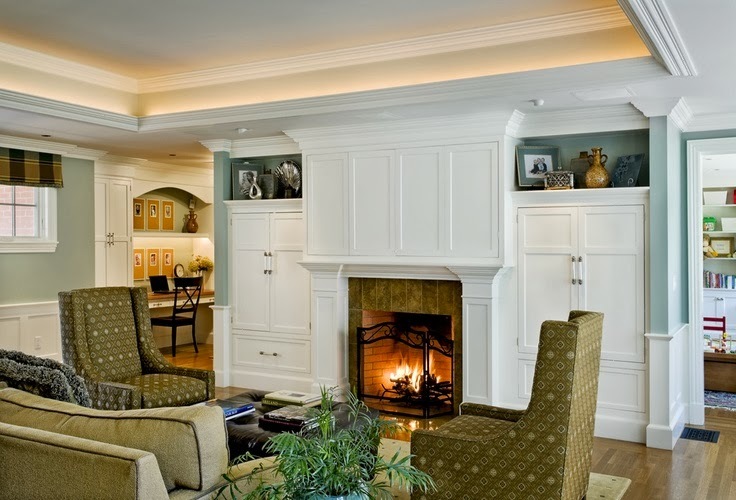 Even a little update to a fireplace which like you said, is a focal point of the room, is exciting and very worthwhile. We refaced our painted brick with stone veneer and are thrilled with it! Hubby did it himself and he said it was his most rewarding project! Hope you enjoy your new look too! 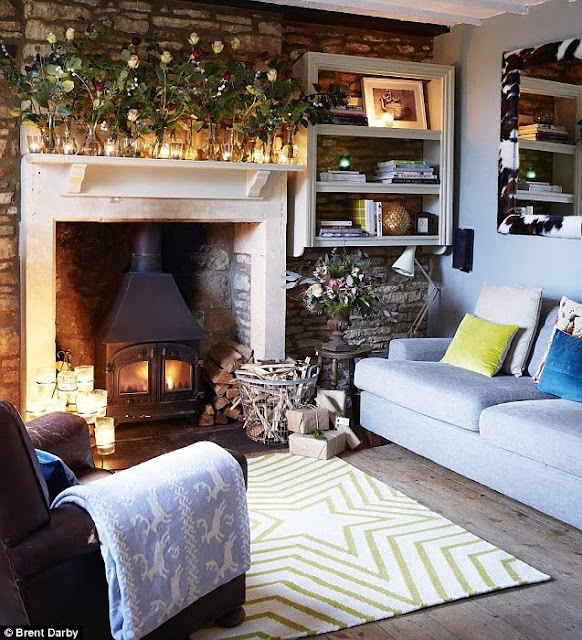 Love all the inspiration and I like what you have done so far with your fireplace! Oh I love a stone fireplace! Ours was multi colored brick and I painted it...twice now! ;) I would LOVE to reface it in stone at some point though. Can't wait to see everything complete! Hi Cindy! Such pretty fireplaces to dream about. Yours looks pretty too. I do like it better without the brass doors. We had the old screen you pushed back and forth and just tossed it and bought a pretty freestanding fireplace screen. Again, you'll come up with the perfect solution. 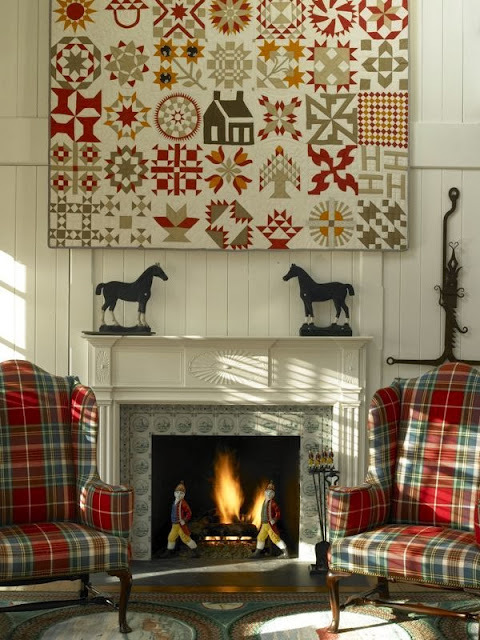 Aw, go ahead and do builtins on each side of the fireplace like mine. We'll be twinsies again! Your living room is gorgeous. I enjoyed seeing the many pretty fireplaces. Good luck on your remodel! 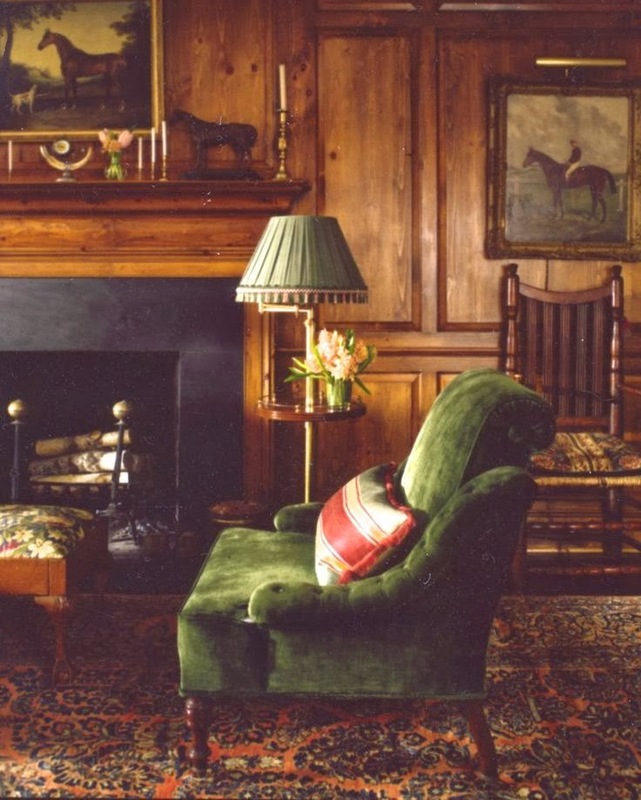 Cindy, you've shown such pretty fireplaces and rooms. Then when I saw the last one I thought, oh that's pretty! And it was yours. I can't wait to see how it all comes together. but if you are gonna have grandchildren right up the street, you might want to do some research on it............just a thought!! 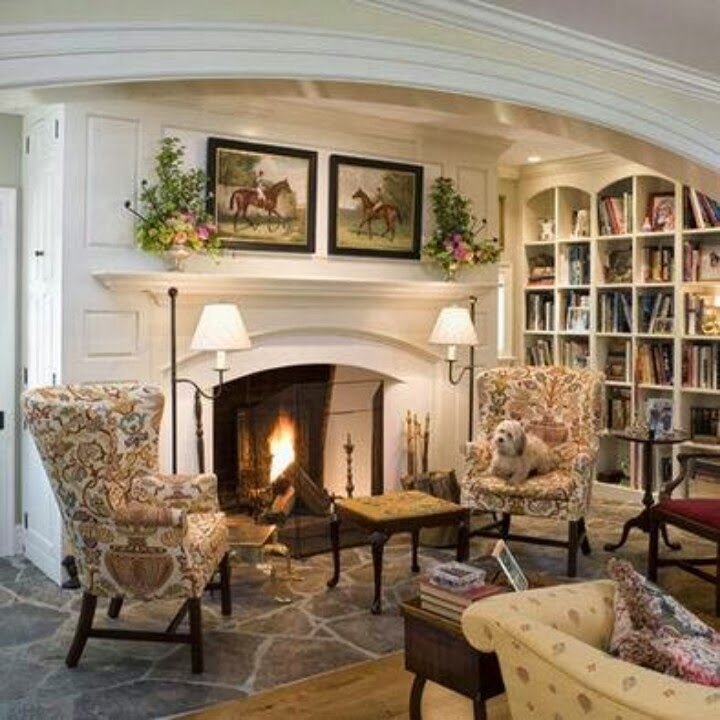 Great looking fireplace! When it's completely done, I'm sure it'll be awesome! What wonderful looking fireplaces you shared with us! Love the first one! 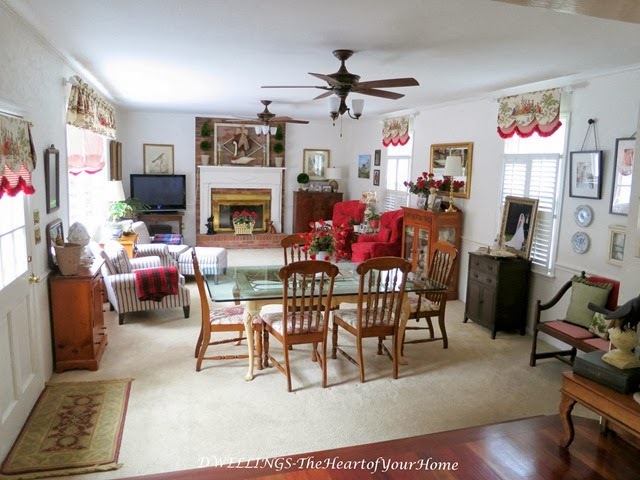 We have a granite and wood fireplace and it faces both our great room and living room. 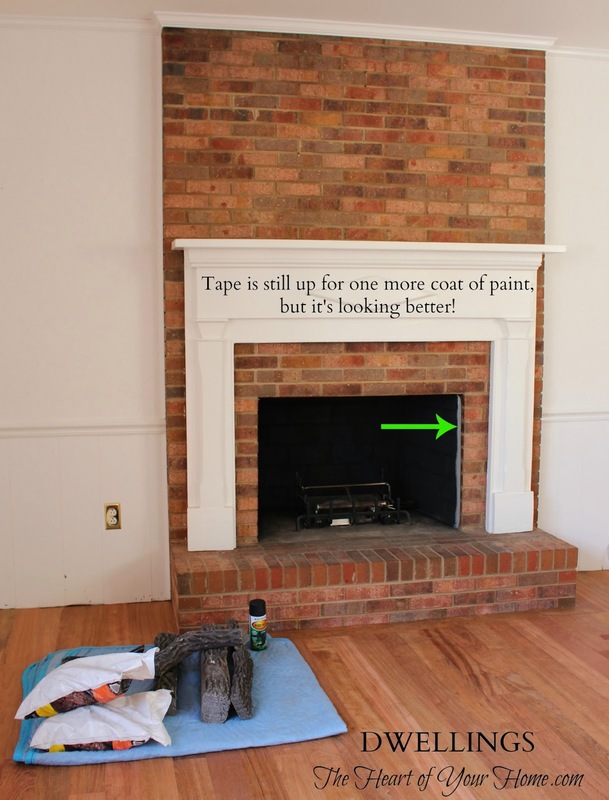 I'll be back to see the finished fireplace soon! 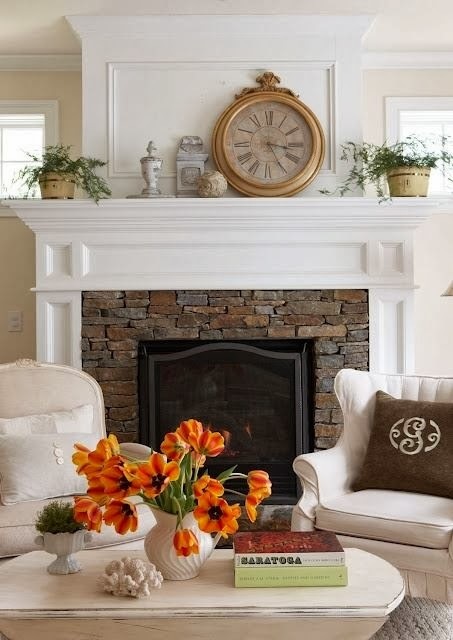 I love the ones with stone and heavy moldings....we have to finish our fireplace in our Reno so thanks for the great inspiration pictures. I also like the painted brick ones as well..... I know, I'm not much help!! Love all your inspiration photos Cindy!! What about whitewashing your brick...I love that look! We are having similar fireplace thoughts. We have stained wood wainscoting below the chair rail which I want to paint. I am still selling that idea to my husband. And, that idea includes what to do with our fireplace brick. 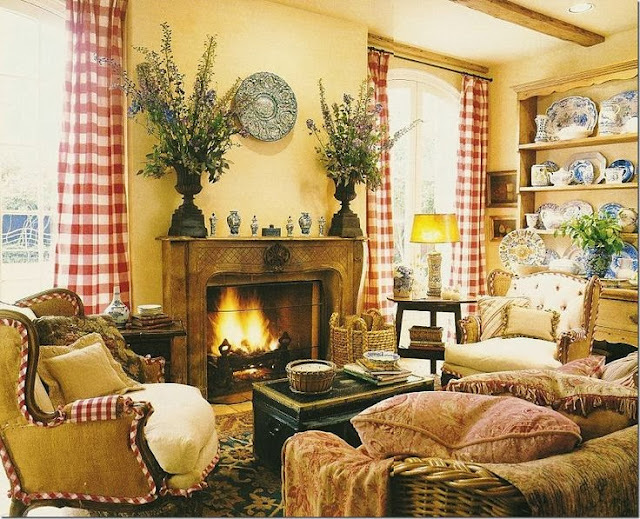 I have a fireplace problem myself Cindy, I need to re-do mine seriously! And I would love for it to be stone - for sure! Just because I need it to go all the way up to the ceiling (and ours is 25 feet). However, cost is getting the way of this project, hopefully someday. 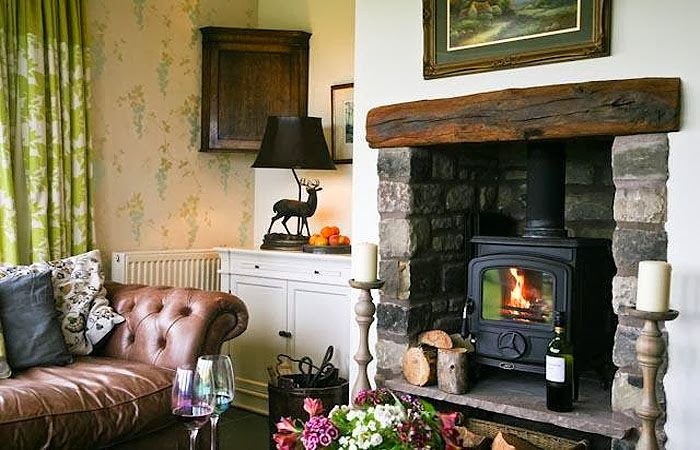 I love yours and love that your keeping it in your kitchen, it's always nice to have fireplace everywhere in the home, totally agree with you on that. Love the changes so far, excite to see your new floors! I truly enjoyed all of the beautiful fireplace/mantel inspiration..you must be so excited and anxious about your remodel…I am with Martina…I think the brick would look beautiful with a whitewash effect…but whatever you decide, I know it will be truly beautiful. I'm going to pin some of your pictures! Amazing inspiration! I live in a stone cottage, but weirdly enough none of the stone fireplaces were still there when I bought, so I found an old mantel that I use to add some charm. So much beautiful inspiration! You have great bones to work with. We have a fireplace that is in the corner, and it puts out almost no heat whatsoever. It's difficult to decorate around too. 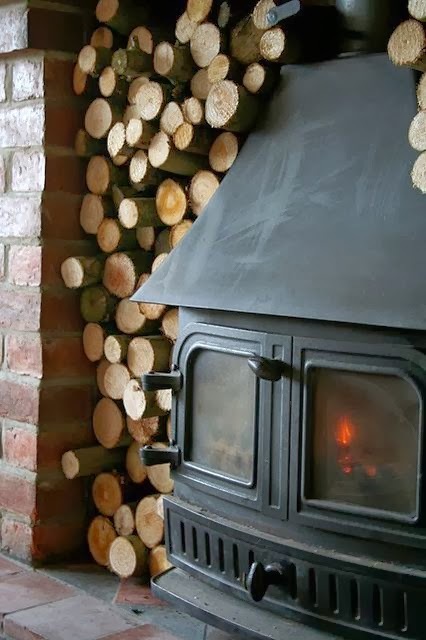 My hubby talks about putting a woodburning stove in its place too. I can't wait to see what you decide on! Have a great weekend! 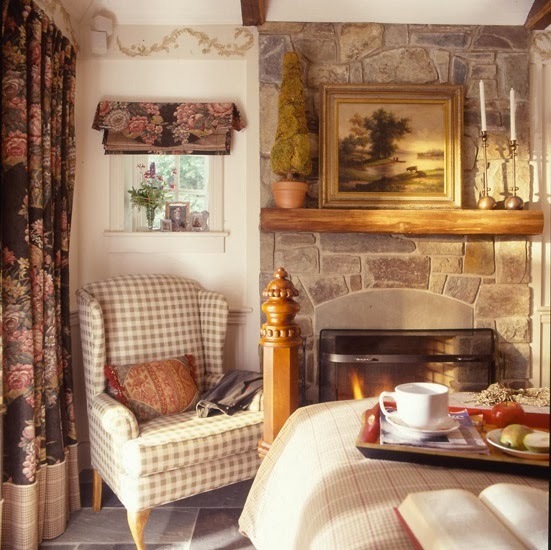 I do love that bedroom picture with the fireplace, too, Cindy! That would be a dream bedroom for me. I love the stone fireplaces. Friends of ours had stone done on theirs recently all the way up to the vaulted ceiling like in the first picture. It really made it the focal point of the room. We have tile on ours, with no current plans to change it, but if we did I think my husband and I are in agreement that it would be stone. You did an excellent job on redoing yours - much prettier now!